When the weather cools, we think of game: venison, wild boar, elk, rabbit, duck, pheasant, quail  wild ingredients that are the flavors of winter. Adding game meats to fall and winter menus has been standard practice in kitchens since there were restaurants. This is true even in the West where we are largely immune to the frosty winters faced by the rest of the country. After all, the fall and winter is hunting season. Still, adding game meats to a modern menu can be risky, depending on what sort of restaurant you run. Game can be expensive, sometimes exceedingly so. It’s impossibly lean, going from perfect to spoiled in a matter of seconds, making this a difficult set of meats to leave in the hands of your line cooks. Sourcing game consistently can be a problem, especially if you aim to be all local, all the time. Finally, game meats have a limited appeal to diners raised on chicken, beef and pork. But game can be a hit on your menu: It’s done all over the West, ranging from restaurants that feature game as a prominent part of their experience, like the Tractor Room in San Diego, or just as a seasonal accent, as Taste does in the wine country of Amador County. A century ago, swanky restaurants all over America regularly featured canvasback ducks, local venison, even mountain goat. Wild game was abundant, and it was often cheaper for a restaurateur to put venison on a menu than it was to feature beef. By the 1920s, however, true wild game was so depleted in America that the sale of it was outlawed, a ban that remains in effect today. Filling the gap has been a cohort of risk-taking ranchers who have tinkered with the tricky task of ranching game animals  notably bison, elk, exotic species of deer and ostrich (even though a bird)  are treated more like venison in the kitchen. Broken Arrow Ranch in Texas is a notable game purveyor, where many of America’s best chefs source their venison and wild boar. Elk ranches in Colorado and deer farms in the Midwest fill in the gaps. Incidentally, most ranched deer is not native to the United States. Rather, it is typically African Nilgai antelope, Eurasian Axis also known as fallow deer, or European red deer (cervena), which is often imported from New Zealand where the species was brought from the United Kingdom in the late 1800s. These days the only way a restaurant can legally put true wild game on a menu is to either import the meat from Europe as is done with wild hares and many exotic game birds, or to have diners bring their game in themselves. Several Northern California restaurants do this, such as Sacramento restaurants, Frank Fat’s and Grange. A guest, typically a hunter, calls ahead and sets up a dinner party, bringing in the game meat several days in advance, followed by a game feast cooked by the chef. Legally, the restaurant can do this because the customer is paying for the chef’s skill in preparation, as well as for all the accompaniments to the dinner. Prices for a multi-course meal like this typically start at $30 per person. Western chefs have a special challenge to serving game meats: For the most part, the West is warm, especially in summer. Las Vegas and Sacramento can easily reach 105 degrees on a summer’s day, which is not ideal for braised game stews. Chef KC Fazel of Tender, in the Luxor Hotel and Casino in Vegas, keeps things light by offering a tapas-like tasting trio of a braised Nilgai antelope shank, seared Axis venison medallion and grilled boar tenderloin, all served with chutney and a huckleberry sauce. 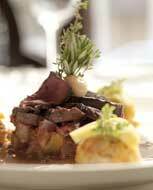 Chef Gloria Ciccarone-Nehls of Big 4 in San Francisco also serves her venison with huckleberries. Fazel loves his dish because “between the three, you get three different meat components and three different cooking methods.” He says this dish has been so popular because it is a low-stress way for the uninitiated to try game. “People don’t want a huge piece of meat they have to be committed to,” he said. Chef Mark Berkner of Taste adjusts to the seasons by typically putting venison on the menu only in autumn. “It’s deer season, so it makes sense,” he said, “venison is on people’s minds right now.” Amador County can still be in the 80s or even 90s in Fall, so he offers a venison carpaccio with orange zest, thyme, capers, good local olive oil and arugula. Berkner only uses game sparingly on his menu since Tender is primarily a steakhouse. Contrast that with San Diego’s Tractor Room, where Chef Andy Beardslee has made game the mainstay of his restaurant’s menu. The Tractor Room is not what you’d think of when you imagine a “San Diego restaurant.” Beardslee and co-owner Johnny Rivera have created a space that screams game: dark wood panels, lots of “brown liquor” at the bar, a cigar-friendly environment. “It actually looks like a hunting lodge,” Beardslee said. “I really wanted to do something different with meat,” he said. And that’s exactly what Beardslee and Rivera did. Cutting-edge dishes such as crispy-fried elk sausage ravioli with a demi-glace cream and boar-and-mashed potato spring rolls, as well as homey offerings like venison meatloaf and buffalo quesadillas, take the typical game meat dish to a new level. The Tractor Room’s bar follows in the footsteps of the kitchen, offering a Bloody Mary that uses a strip of venison jerky as a stirring stick. Chef Sophiane Benaouda of the Grand Café in San Francisco takes a slightly lighter approach to featuring game. “Just to be different,” Benaouda created a “game night” about a year ago, letting him flex his French-trained muscles, since the French are widely considered the masters of game cookery after all; at least in the Western tradition. Benaouda plays within the French tradition, using pheasant, venison and boar, often in classic dishes such as salmis, which requires that the sauce be thickened with the animal’s blood. Benaouda says he often leaves this little detail out of the menu description. In a word, consistency. The single toughest problem facing a chef who wants to make game a prominent part of a menu is getting the product regularly and at consistent quality. “They don’t want it one week to be one way, then in another week be another way,” said Chef John Paul Khoury of Preferred Meats, a regional purveyor. Chef Tuohy of Grange in Sacramento faces another challenge to those wanting to feature game: in the West, it can be impossible to find it locally. Grange’s ethic is all-local, all the time, and while Tuohy says he loves to work with venison or wild boar, he’d have to get it from Texas  too far for a locavore restaurant. For Chef Beardslee, the bottom line to being successful with game is to buy whole cuts, even whole animals, and use them in a variety of dishes. One night might be a special on loins, another a stew with leg or shoulder, and the rest can wind up on a charcuterie plate or in a ragu. Chef Fazel’s approach is to offer small plates as a way for diners to dip into game lightly without committing to it for their entire meal. Despite each chef’s individual take on game meat, everyone stressed the importance of training both line cooks and wait staff about the special nature of game meats. As a result of their lean character, they are unforgiving on the fire and fine cuts should never, ever be served beyond medium. The chefs also noted that different markets will react to different presentations. A game meat preparation using modernist technology  transglutaminase, sous vide, etc  might work on some audiences and fail utterly in another. Some markets and restaurants demand a more classic approach, but even within that stricture there is room for creativity. Similarly, Fazel advises to “Study up on game, research it. Don’t be afraid just because you haven’t dealt with game before. Experiment.” If your kitchen has not already worked with wild boar, antelope, venison and elk, it’s time to get into the game.